We, at East Coast Firewood, are proud to provide the highest quality hardwood firewood products available anywhere, with an unparalleled chain of custody; which includes our hands-on approach from the harvesting of standing timber, to the transportation of the hardwood logs, to our state-of-the art production and manufacturing facility. Through these quality control measures we are able to ensure sustainability of the raw materials needed to produce an environmentally safe and high quality product for our customers today and for future generations to come. East Coast Firewood, LLC is part of the forest resources and timber management professionals of Hunt Forest Resources, LLC. As an affiliated company the firewood division has the knowledge, expertise and capabilities necessary to control every aspect of the process, in order to achieve the desired high-quality finished products that you deserve. See below for some basic facts and information regarding firewood. Knowledge is power, as they say, and we at East Coast Firewood want you to understand the “basics of firewood” so you can make informed decisions about which products best suit your needs. Contact us for delivery options to your location. Kiln dried firewood is exactly as the name implies. It is split firewood that has been run through a kiln cycle, which is typically a 24-48 hour process of heating the wood to 250 degrees inside of a specialized enclosed and insulated containment unit. As moisture is "pulled" from the firewood during the heating process it is then forced out of the kiln, in the form of steam, through a ventilation system. Probes placed inside random pieces of firewood ensure that all of the wood within the particular kiln cycle has reached the optimal internal temperatures to not only qualify as USDA certified pest and mold-spore free, but that the wood has reached a much lower moisture content...making it ready to burn hot and clean. Our kiln-dried hardwood firewood generally has a 8-12% moisture content, making it easy to light, as well as burning hot and clean. We continually strive to provide you only the best quality firewood with the most friendly and professional customer service available. 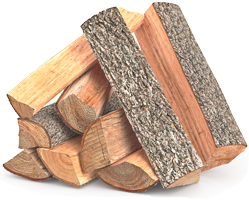 Our kiln-dried hardwood firewood selection is the cleanest burning, bug and mold-spore free, and burns the hottest and most consistent. Note: Our kiln-dried firewood far exceeds current USDA certification standards and all State regulations, which allows it to be moved across any state lines and utilized within any State or National Park and/or Campgrounds. Our restaurant grade product never touches the ground from the time it is split to the time it is delivered, ensuring the absolute cleanest, hottest burning product available. True "seasoned" firewood generally has a moisture content of around 18-25% and typically takes between 6-10 months to achieve under normal outdoor conditions. Fun Fact: Freshly split (green) hardwood firewood often has around 50-60% moisture content, which is why it is difficult to light and even more challenging to make it burn hot and consistent. Actual seasoned firewood will usually have a consistent brown or "weathered" appearance, compared to freshly split (green) wood, which generally has a more creme or beige coloration. Our splitting process involves tumbling the firewood on multiple occasions to help clean the wood of dirt, debris and loose bark , which ensures you receive the cleanest seasoned firewood available. East Coast Firewood also regularly analyzes our products with certified moisture readers to aid in the quality control aspect of the business, allowing us to provide you only the best quality products on a consistent year-round basis. We split firewood all year long and continually rotate our inventory, so that we will never run out of product that you need or desire for your heating, cooking and pleasurable needs. BTU stands for British Thermal Unit, and is a unit of heat that is defined as the amount of heat required to raise the temperature of one pound of water by one degree Fahrenheit. What that means for firewood products is this: the higher the BTU, the hotter your firewood embers will get. True seasoned and kiln-dried firewood will give off more BTUs than regular green firewood due to their lower moisture content, thereby providing for a product that is easier to light and will burn more consistent. As it relates to cooking or smoking, good quality "hard" hardwoods such as oaks and hickory, will provide the highest output of BTU's, which ultimately give you the longest and hottest burning embers. The best firewood product for you all depends on your needs and objectives. Choosing a type of firewood is relatively simple, once you understand the various types of products and what their benefits and potential weaknesses may be. Generally speaking, most firewood purchased and consumed within the United States consist of hardwoods, such as oaks, hickory, poplar, maple, etc. When people refer to "softwoods" they are typically referring to various species of pine. In regards to cooking wood or inside wood-burning stoves or fireplaces, pine is usually not the best choice of wood. Due to their high resin content pine firewood will produce a "less than desirable" bitter taste in foods, often create higher than normal amounts of smoke and ultimately can cause an unsafe build-up of creosote (which if left unchecked could instigate a chimney fire) inside of a fireplace or chimney. So, with that said, most firewood suppliers don't carry pine as a firewood alternative. We can split and supply pine on demand, if requested. Now, back to the hardwoods. As strange as it may sound there are actually species of hardwood that are considered "soft hardwoods" and others that are considered "hard hardwoods". Soft hardwoods consist of species of poplar, gum, elm, maple, beech, birch, etc. Hard hardwoods in most of the eastern United States consists of species of oaks and hickories. Because hard hardwoods are generally more dense they often burn a little hotter and longer, making for a slightly more efficient burning product. If soft hardwoods are properly seasoned or kiln-dried they will provide adequate heat, a consistent burn and an overall quality burning experience. For smoking or grilling foods, options may include hickories, pecan, white oak or cherry. These woods have specific smoke qualities and aromatic "signatures" that may infuse their "taste" into the meats or foods being cooked. All of these products are available and ready to meet your needs. White Oak and Red Oak are a "hard" hardwood species and are some of the best burning firewood available. Because of their dense nature, once properly seasoned or kiln-dried, they will give off high amounts of BTU's, thereby producing hot and consistently long burning embers. Oaks burn extremely efficiently, meaning they produce maximum heat but are slow to dissipate. We have both white and red oak products available, so call us today to learn more and place your order. Hickory is another "hard" hardwood species that is dense, allowing it to burn longer and hotter than some other hardwood species. Hickory provides an aromatic "sweet smoky flavoring" to foods and has long been a favorite for all varieties of BBQ cooking. Hickory is an overall great firewood for fireplaces and campfires, as well as grilling and smoking. Our mixed hardwood firewood is the best selection for an overall high-quality product for the best value. While it consist of primarily white oak, red oak and hickory it does have a mixture of poplar, gum, ash and maple. Because our mixed hardwood firewood is properly seasoned or kiln-dried it provides a very uniform, consistent and hot burning fire. We, at East Coast Firewood, also provide a variety of specialty cooking woods, and upon request, can make arrangements to meet nearly every demand or need. Some of our specialty products include all hickory, pecan, cherry, all white oak and even a oak/hickory blend that we re-split to an even smaller size for pizza ovens and small wood-fired grills. These products are available for restaurants, novice or professional grillers/smokers, commercial establishments or the residential customer. Call us today to place your order.